I spotted a headline the other day and I thought - that would make a great layout title. So I wrote it down "About That Time.." It's a non-title title: It says just enough to draw you in, make you want to read more, without giving away the whole story. It's adaptable, too. You could use it more than once and I don't think anyone would even notice. It says "come and read this.." It's a hook. Mmm..I thought..a list of go to, reel-you-in titles would be a handy thing to have. So I made one, and here it is. You are very welcome to make use of it too. Pick one to add to a nameless page you have already made or use them as starting point to ease you into a partly formed page you've been thinking about for a while. There are twenty non-title titles here - and if you try every one a handful of times each, that's coming close to one hundred layouts you haven't had to think about naming..
- And Then I Said..
- No one Knows This But You..
- There Was This One Time..
- Have You Got a Minute? - Now That I Think About It..
- This One Means a Lot..
- Here's One You Might Like..
- The Case of the..
- The Long and the Short of It..
Print it, Pin it, use it any way you please. Great list Sian. All of those titles could work for so many different pages and blog posts too. I titled one 'The Long and the Short of it' a week or so ago! Fiona is right...many of these would be perfect for blog post titles as well....and it is those that often elude me.....I think I'll be coming back to a few of these!! Glad to hear your weather is perking up. Thanks for all the titles! Sometimes I struggle finding the right one. These are all perfect for just about any layout. My first thought was" or Blog Post!" Love it, clever you and thank you for sharing your list. Oh yes, the blog post idea struck me too - great starters Sian .. we shall look forward to seeing one appearing here soon! Great list Sian. I am currently putting together a mini book class and trying to think of a generic title for the theme. I'll have to come back to your list if I don't come up with one in time! Already copied, saved and printed. Thanks! Brilliant! I can never think of a good title so lots so inspiration here! Thanks. Gosh you have got my brain whirring here Sian! Such good inspiration for blog posts! What great starting points :). Food for thought indeed! "If I only knew then what I know now ..."
"It's not the what, it's the how ..."
"If I've said it once ..."
I like such things as a reason to create a page - don't always put a title on tho', odd that but there you go! Little did they know . . . I'm book marking these to use as journaling prompts for art journal pages. Thanks! And thank you for not suggesting one word titles like "believe," "wonder," etc. Although I could definitely get behind a one word title like "Precious." Oh brilliant Sian. I really, really struggle with titles on my layouts. I know from experience that people like my layouts much better when they have titles but I struggle with titles that are traditional and these are things I would actually say and so feel right. Written and pinned just so I don't lose them as I think far too much about the titles on my LOs. While I was writing them down, I did think of Now that's what I call....(well, I was actually mis reading one of urs lol), but I think I will be hitting my cd/dvd collection to 'borrow' a few more ideas. Thanks for the inspiration. Great list and I'm sure I'll be using a few of them. I'm so good at coming up with titles for other people's layouts but never my own! Awesome list! Definetly using these in the future - with a link back here of course! :) Confessions of a scrapbooker...brilliant! That could make a whole lot of layouts or a mini book! Going to do that one for sure! Super list, I have no excuse now! Thanks for the ideas. What a great list! It gave me a bunch of ideas for a photo I just took. Nifty idea, Sian. Titles, for me, are all-important. 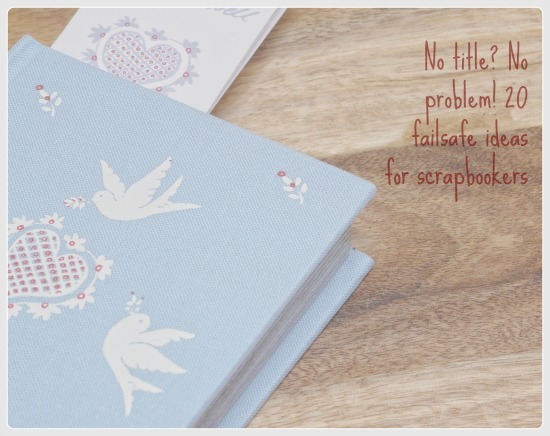 I almost can't start a scrapbook page or a blog post without first having settled on a title. Deciding on a title helps me narrow my focus and, as I make my way through the project, if I feel like I'm getting off track, I only have to refer to my title in order to re-focus. Of course, we all know that posts and pages sometimes take unexpected turns and end up as something quite different than originally intended, so I do reserve the right to change my title as I go along. What a brilliant collection of titles! My friend has a scrapbooking quotes book that loads of people use at the crops for title inspiration and now you've given me the idea of adding potential titles to my little inspiration book - thank you! Super Cool Sian! And thanks for posting Dad's story. He was super happy! Me too I had found some sun finally on vacation! Someone on blog land said something about playing along with your sketch so I'm off to stalk the rest of your blog! Hehe...what a great list of ideas. I'm going to use them. Thanks for sharing! What a fantastic idea will make a note of those title and let you know when I use one. This is a great list! Most of the time I pull my title from my journaling, but sometimes I get stuck. Fantastic list! I shall print this one. A brilliant idea! I am printing it out and sticking it in my desk!